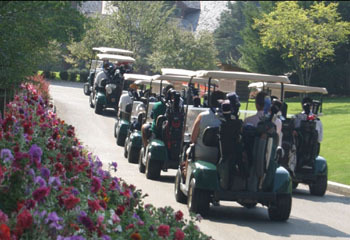 Professional Golf Outing Services are our Specialty! Thinking of planning a customer appreciation outing? Maybe a fundraiser, or a day of relaxing and enjoyable golf for your staff? Just remember that any occasion on your calendar becomes a special occasion when you allow us to host your outing. Take it a step further with the Purdue Golf Experience! On the campus of Purdue University in West Lafayette, Indiana the Birck Boilermaker Golf Complex is conveniently located one hour north of Indianapolis and just two hours south of Chicago. Your group of 12 to 500 players can challenge either or both of our immaculate golf courses: the Kampen Course, a Pete Dye design, or the Ackerman Hills course. Add our weather-protected Voinoff Pavilion, with a fireplace and stage, a cozy clubhouse, and a world-class practice facility and you've found the finest facility for your next golf event. Our professional staff handles the details. You take all the glory! We've made our share of novice golf outing coordinators look like Rhodes Scholar candidates. And we love doing it! All you have to do is decide your guest list and preferred date. Your clients and colleagues are sure to enjoy, appreciate and remember their spectacular day as your guest at the Birck Boilermaker Golf Complex. Prize fund & Professional tournament scoring. The second-most important aspect to outing success? Food! It just wouldn't be fun to gather your group of golfers for a day of recreation … and then send them home hungry! We oversee the catering for all events at the golf complex and can serve your guests of up to 500+ so no one leaves hungry! Repeat business is always appreciated, because it tells us that we've done our job to great satisfaction. It also means you better call me as soon as you have a date in mind for your next outing! Whether you're a scratch golfer who loves organizing your company's annual outing … or you were the one "elected” by the short straw, we're here to help you with every detail of your outing! Click here for more information on your next outing or call Assistant Professional Brent Wills at (765) 496-9310 today!